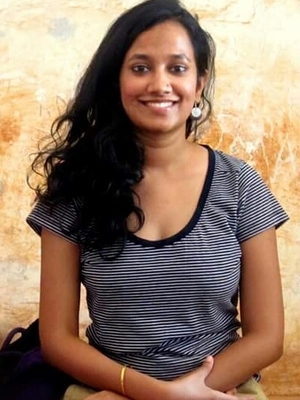 Sujatha Subramanian is a PhD Student and a Distinguished University Fellow at the Department of Women's, Gender and Sexuality Studies. Through her doctoral dissertation, she would like to explore how girls hailing from different socio-economic backgrounds in the city of Mumbai envision their future selves and how their aspirations intersect with ideas of gender, spaces and places, and mobility. In addition to researching and theorizing on girls and girlhoods, she envisions working with girls on issues of social justice and working towards advocacy that sees a greater participation of girls. “From the Streets to the Web: Looking at Feminist Activism on Social Media.” Review of Women's Studies, Economic and Political Weekly. Vol - L No. 17, April 25, 2015. “Being Fake, Being Online: Young Women‟s Self-Expressions through Multiple Profiles on Social Media.” InPlainspeak, TARSHI, July 1, 2015. “Why I Decided to Study Feminist Activism on Social Media.” GENDERIT.ORG, June 15, 2015. “The Dirty Picture.” InPlainspeak, TARSHI, 2014.